Ford is launching a new even more efficient version of its 1.0-litre EcoBoost three-cylinder engine in the Focus - which emits just 99g/km of CO2. The specially calibrated version of the 100PS returns a claimed 65.7mpg thanks to ultra-low rolling resistance tyres and revised gearing. The 1.0 EcoBoost engine is actually more powerful than a first generation Focus 1.6-litre petrol from less than 10 years ago yet produces almost 50 per cent less CO2. Alongside the new 99g/km version Ford will still be offering the two existing 1.0 EcoBoost models - a 100PS version with 109g/km CO2 and the 125PS version which emits 114g/km. Ford's impressive EcoBoost engine is now available in the Fiesta, B-MAX, C-MAX and Grand C-MAX and it will be going into more models including the forthcoming EcoSport, the new Transit Connect and the Transit Courier, both due next year. 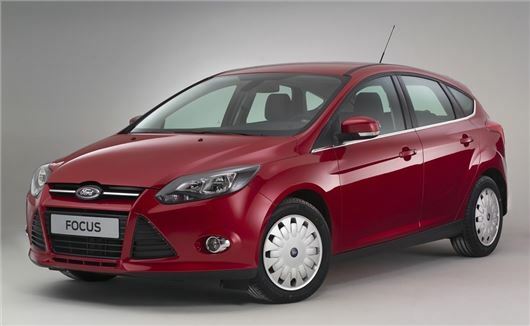 The all-new Mondeo, which has been delayed and will not be launched until late 2014, will also get the 1.0-litre engine. The future will see Ford launching a zero emissions Focus Electric and there is already the diesel-powered Focus Econetic which emits just 88g/km of CO2. Meanwhile, Ford has launched the Focus Zetec Navigator, which as the name suggests, gets sat nav included along with new design 16-inch alloy wheels. There is also the Titanium Navigator which replaces the Titanium trim and adds Sony satellite navigation, new 16-inch alloy wheels and rear parking sensors. The Titanium X Navigator replaces the Titanium X, adding Sony sat nav, a rear view camera and new 17-inch alloy wheels. These models are priced from £17,555, £19,295 and £21,295 respectively, compared with £17,305, £19,045 and £21,045 for Zetec, Titanium and Titanium X currently. "...and - if you live in London - no having to pay the congestion charge." C-Charge exemption rules changed over a month ago now - as a result of the Greener Vehicle Discount being abolished, cars with a 76g/km to 100g/km output (such as this) purchased from now on are no longer to access the C-Charge Zone for free as before. Keep up!